Is there any local coverage? The Online Slang Dictionary defines astroturfing as "the creation of lobbying groups that appear to be separate from corporate interests, but that are actually funded by them. As opposed to "grassroots" political activism." The origins of the word most likely came from the first baseball field with fake or artificial grass (it didn’t have "grass roots") – the Astrodome which used "Astroturf." Thus, astroturfed material appears to come from real grassroots action but it is actually fake. If you've ever read product reviews online, you’ve probably been astroturfed. Letters to the editor are sometimes examples of astroturf. Organizations, often with noble-sounding names that appear to have our best interests at heart but are really serving others, would be another example. 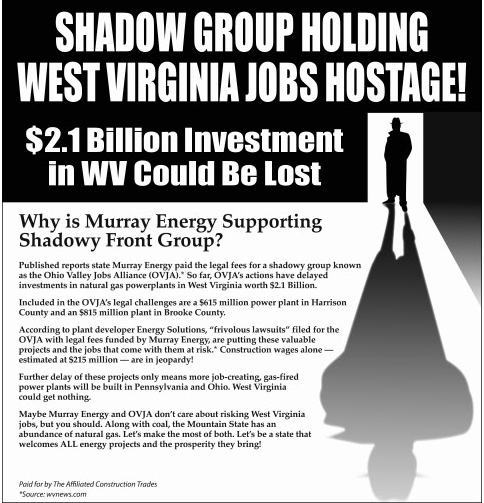 In my blog post, I expressed skepticism that this was a “grassroots” organization; more likely it was an astroturf group funded by a coal company or coal association. Funded because, as the Intelligencer article explained, the group was planning lawsuits to prevent the construction of natural gas power plants. What has happened to this “grassroots” organization? The Ohio Valley Jobs Alliance is a grassroots organization and movement whose mission is to promote and protect the good paying jobs in the Ohio Valley. A proposed power plant project in Harrison County is getting closer to becoming a reality, according to its developers. John Black, vice president of development for Energy Solutions, said the Harrison Power Natural Gas Power Plant has only one remaining obstacle standing in the way of the start of construction. That hurdle is an appeal, filed by the Ohio Valley Jobs Alliance, against the project’s air permit, Black said. According to allegations from Black and his colleagues, the organization is backed by Murray Energy Corporation, one of the largest independent operators of coal mines in the United States. Robert E. Murray, chairman, president and chief executive officer of Murray Energy, has denied those allegations. How has this battle between natural gas and coal been covered in the local papers? For the most part, it hasn't: the paper's online search engine has no references to the Ohio Valley Jobs Alliance after November 2017. Our emphasis is and always has been accurate accounts of what is going on in the Ohio Valley and elsewhere in West Virginia and Ohio.